Bitcoin (BTC) is hovering under $5,100, mostly unchanged since the beginning of the day. The first digital coin lost 1.5% since this time on Monday and stayed mostly unchanged since the beginning of the day. The cryptocurrency market slipped in the red zone after a short-lived recovery attempt; however, all major coins are still sitting in their respective ranges. The strongest technical levels are clustered above the current price, which means that the recovery looks like a hard task at this stage. The next resistance is seen on approach $5,360. It is created by 23.6% Fibo retracement weekly and 161.8% Fibo projection daily. The critical barrier $5,400 is strengthened by a Pivot Point 1-week Resistance 1 and Pivot Point 1-day Resistance 3 and followed by the previous week high at $5,468. 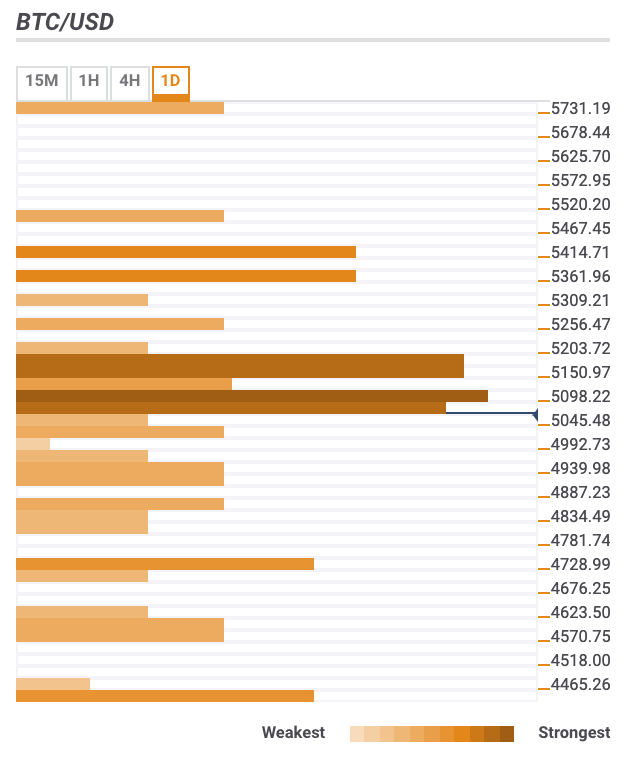 Below the current price, the first support area is created by SMA100 4-hour on approach to $3,900.